Japan loves it some Monster Hunter. Take the latest version, the PSP to PlayStation 3 port—or if you prefer "PSP Remaster"—Monster Hunter Portable 3rd HD Version. It's Japan's hottest game right now. 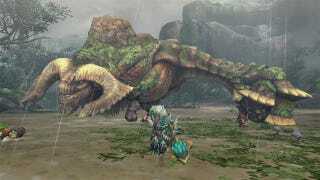 The PS3 update of Monster Hunter Portable 3rd sold more than a quarter million copies in its debut week in Japan. Quite good. But not nearly as good as the 1.9 million copies the PSP version sold during its first week on the market. Still, pretty good news for Sony and Capcom. Media Create's top ten sales chart was dominated by PSP and PS3 software, with a ton of new Japanese-flavored games debuting in the top five. Gundam stuff. Musou stuff. Just no Gundam Musou stuff. Read on for the top 20 games in Japan for the week of August 22 to 28, courtesy of sales tracker Media Create. On the hardware front, the cheaper Nintendo 3DS reigns supreme, selling nearly twice its closest competitor, the PlayStation 3. Hopefully for Nintendo, that'll mean more 3DS games (other than The Legend of Zelda: Ocarina of Time 3D) showing up in the software bestsellers chart.